Despite the final result, tonight's match had plenty of reasons to keep us interested. In fact, seldom has a match provided such a clear contrast between two opposing styles of approaching football. Newcastle manager Alan Pardew remained true to himself and rotated most of his team, even including his third-choice goalkeeper, but keeping his back four intact. The English eleven was significantly different from the one that played Everton last Monday. As for Marítimo, Pedro Martins played the same men with the exception of Luís Olim instead of Ruben Ferreira. This was in fact a match that provided a perfect example of two very different football philosophies. On one hand, the Magpies played their usual 4x4x2, with Vuckic playing just off Shola Ameobi, and went for what could be described as typical British style: long balls toward the big man, who tried to flick it down to a smaller, quicker forward. The team from Madeira, on the other hand, favoured a typically Portuguese 4x3x3, more dynamic and with greater movement. Nevertheless, the central forwards of the two teams (since Danilo Dias can hardly be described as a striker) constitute the most paradigmatic examples of each team, summarised their approach to perfection. 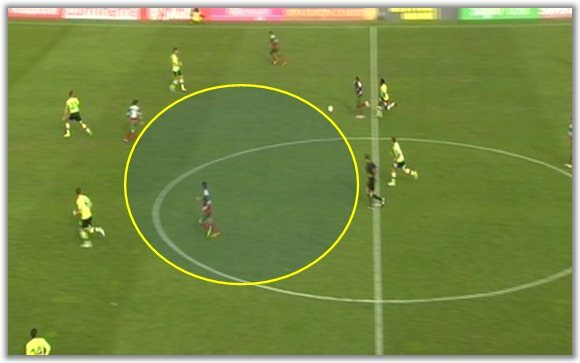 As mentioned earlier, Newcastle chose long, direct balls towards Ameobi as their favourite route. Without Demba Ba, Papis Cissé, but most importantly Yohann Cabayé and Hatem Ben Arfa, Pardew's men were not eager to keep the ball on the ground and did not hesitate to hoof the ball forward and wait for the outcome. With Vuckic far from his best form, Ameobi's flick-ons were not particularly useful, especially because both Obertan and Amalfitano were static and miles away from the right place to pick up second balls. As for Gosling and Bigirimana, they often found themselves trying to pick up the slack and provide an outlet to follow up Ameobi's efforts, which in turn gave Marítimo all the more room to maneuver. With both wingers out of the game and both central-midfielderes trying to shorten the distance up front, Newcastle's back four was often left exposed, allowing Marítimo forwards to run riot for most of the first half. Bigirimana, in particular, often seemed unsure about what to do defensively during the first half. As he became apparently more and more frustrated by the Portuguese team's patient build-up play, he tried to pressure one of the centre-backs, only to realise moments later that Gosling was surrounded by opposing midfielders. The situation was made worse because there was no definitive response about who should be marking Marítimo's restless forward Danilo. Bigirimana and Gosling often left the Newcastle defence exposed. The second half was clearly better for the Magpies, who took control of the match, namely after Sammy Ameobi replaced Vuckic and Marítimo centre-backs started tiring out. 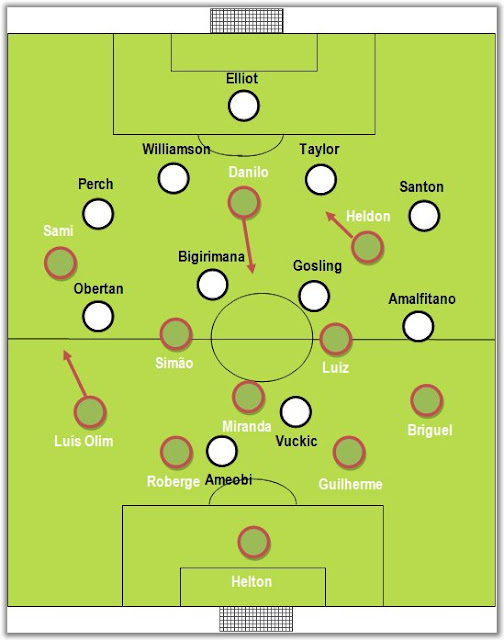 In fact, while Newcastle found it hard to take the match up to their rival's penalty box in the first half, it was much easier for them, since both Roberge and João Guilherme started losing the right positioning more and more often. 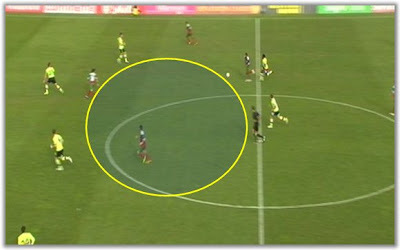 Newcastle went decidedly for route one and may count themselves unlucky for not scoring in the second half. In conclusion, their defence was shaky and far too vulnerable to quick play behind their back, but they countered with a sort of football that Marítimo are just not used to. Ameobi proved that he can still be useful, either for less important matches (to take the strain off Papis Cissé and Demba Ba) or as a plan B. This was typical Portuguese football. Lots of clever movement, wingers drifting inside to allow the midfielders and the full-back to exploit the flanks, numerous opportunities during the first stages of the match and an almost certain defeat as the outcome, after suffering immensely at the hands of powerful forwards. Despite hailing from Brazil, Danilo Dias epitomises the Portuguese forward. Adept at dropping off to open up spaces for his team-mates and (let's be honest) to avoid the physical confrontation with aggressive, intense centre-backs, he is the player that makes the whole team tick. By dropping back, he often serves as an extra player in midfield to provide the out-ball, misleading the opposing centre-backs into thinking they have no one to mark, only to find out seconds later they are being swarmed by Heldon or Sami. Marítimo had an excellent first half, patiently bringing the ball out from the back and waiting for the right time to find the chink in Newcastle's armour - they had in fact 3 clear-cut scoring chances in the first 12 minutes, all of them from the left flank, thanks in part to Obertan's alienation from his defensive duties. As for the defence, the team from the island of Madeira were almost irreproachable for the first 30 minutes, ensuring their distance from the rest of team was always adequate and providing excellent coverage for the aerial duels with Ameobi. Both wingers helped out defensively to form a 4x1x4x1 in the defensive phase, which contributed to a very good first 30 minutes. However, this game provided enough proof that a) players from the Portuguese league are not used to such physical battles, since there are no forwards in the mould of Ameobi, and b) by whistling at every residual contact in favour of defenders, the Portuguese refereeing is not helping Portuguese teams, who find it very hard to keep the same intensity level as English teams throughout the match. 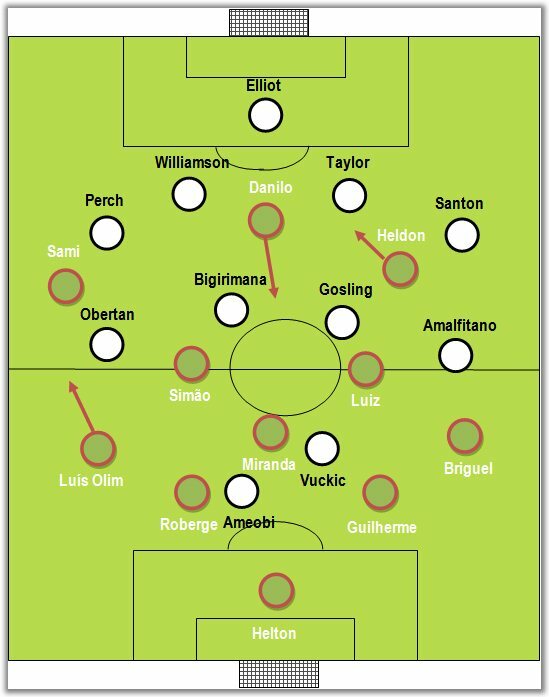 The best example is Roberge and João Guilherme's growing inability, as the game wore on, to contain Newcastle's forwards. In conclusion, Marítimo showed they can hang up there with the big(ger) guns, but they will definitely need to work on keeping up their stamina throughout the entire match and capitalising on the chances they create. Otherwise, this will be an all too familiar tale for Portuguese teams.